What is "Organic" Furniture, and Why is it Important? The dictionary defines organic as: relating to, or derived from living organisms, simple, healthful, close to nature, relating to or affecting organs or an organ of the body. We've all come to understand and appreciate these terms when relating to food and medicine, but the same principles and awareness are rarely placed on the furniture that we fill our homes with. The beds we sleep on, the couches and sofas that our children play on, even the dining table that we eat at are commonly made with chemicals and materials that are harmful to our health and ecosystem. Our goal at Pine Street Natural Interiors is to source furniture that is made from only the finest organic and sustainable sources, and is free of pesticides and chemicals. Our manufacturer works exclusively with vendors who practice humane and fair trade business, and is extremely selective when it comes to choosing materials that offer the most in both style and comfort. The worst offender in modern furniture production is found in the cushions and pillows that make up our most commonly used items. Almost all cushions are filled with foam that is sprayed with a chemical flame retardant called Chlorinated Tris. Since 1975, the Bureau of Home Furnishings and Thermal Insulation has mandated that all foam inserts are able to withstand exposure to a small flame for at least 12 seconds without igniting. Since cheap man made foams are highly flammable, they must be heavily treated with Chlorinated Tris to comply with these standards. The major flaw of flame retardants is that they don’t stay in the foam. As we get up and down and move around, air (and chemicals) from inside the cushions is pumped out into our homes and environments and often settles onto the floor. 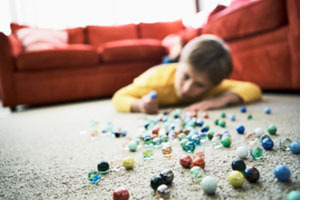 As bad as these chemicals are for adults, young children and pets, who play on the floor in homes containing cushions treated with Chlorinated Tris have been found to have up to three times the level of flame retardants in their blood as their parents. Recent studies at Duke University have found Chlorinated Tris to greatly affect toddlers, causing such health concerns as antisocial behavior, memory loss, diabetes, lower levels of male hormones and hyperthyroidism. The study found flame retardant in the blood of every child they tested. Additionally, among pregnant mothers, concerns ranging from decreased fertility and birth weight to the direct passing of these flame retardants to newborns via breast-feeding are all cause for alarm and a rethinking of our homes and what we put in them. These chemicals find their way out of our doors and windows as well. High concentrations of Chlorinated Tris have been found in animals across the globe, from fish and whales to Polar Bears and Tasmanian Devils. Our manufacturer's Inside Green technology. Smart, healthy, responsible furniture made entirely from Natural Latex, organic wool, organic goose feathers and down. These natural materials are not only superior in terms of comfort and lifespan, but are inherently flame retardant and hypo-allergenic. A commonly misunderstood material that we use in our products is Natural Latex. Natural Latex is a logical choice for people who have health concerns or allergies as it is an antimicrobial material and naturally resists mold and dust mites. Not to be confused with synthetic latex, Natural Latex is inherently hypo-allergenic, renewable, and biodegradable. 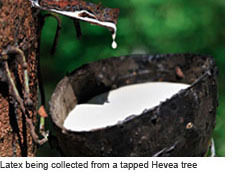 Derived from the whipped and baked resin of the Hevea tree, latex is the most naturally durable cushioning material available. Its open-cell structure helps to relieve pressure points and provides orthopedic support at any angle. For those seeking to avoid foam inserts entirely, our green and healthy line of furniture exclusively uses EcoWool as a comfortable, healthy alternative. EcoWool is sourced from family farms in Oregon and California and is harvested using only the most humane and modern forms of sheep shearing. The farms that these sheep come from follow the strictest guidelines of proper grazing methods and healthy veterinary practices and there are no chemicals or harmful pesticides used in the grazing fields. Expert sheep shearers ensure that the process (which is actually very beneficial to the sheep) is as quick and painless as possible. By sourcing our wool from these small farms, we are keeping our shipping and ecological footprint to a minimum, and we are helping to stimulate local economies here in the US. Once the wool has been sheared and gathered, it is skirted and washed in biodegradable soaps in machines that run on recycled water. Our vendors don’t practice carbonizing, chemical crimping, dipping, bleaching or mulesing EVER. 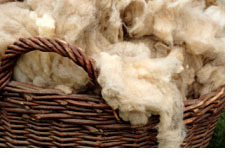 And here’s the best part: beyond all of the naturally beneficial elements that pure wool brings (it acts as a natural air purifier, is resistant to mold and mildew, keeps cool in the summer and warm in the winter), it can pass with ease all of the fire tests that chemically treated foams must pass. The EcoWool used in our healthy furniture collection is as safe if not safer than any of the toxic, commercially available foams on the market currently - and has no negative effects on our health or environment. Along with wool, other natural elements found in our furniture are organic goose feathers and down. Goose feathers have long been seen as the standard that all pillows and fillers are judged against for their comfort and durability, yet only 5% of today’s most popular brands use actual feathers due to their cost. All of the pillows are filled with goose feathers and down sourced from farms that raise geese for food consumptioncompleting a vertically integrated business model which is both financially and ecologically beneficial to local economies and the end consumer. The feathers and down we use are separated by hi-tech machinery and are washed in biodegradable emulsifiers before being packed into 250-thread-count, 100% organic cotton covers. Para Feather: a clean mix of feathers and down channeled in an organic cotton cover, surrounding the 100% pure, natural latex foam core. Para Pure: premium quality wool wrapped twice around the 100% pure, natural latex foam core. The backbone of our furniture is the sturdy construction and framing made entirely of FSC Certified wood. In order for wood to be certified by the Forest Stewardship Council, the foresting practices at each site must adhere to FSC’s requirements on the rights of indigenous people and workers, and must follow strict guidelines regarding environmental impact. These carefully chosen lands are constantly monitored and assessed to ensure that conditions, yield, and management are always up to FSC’s high standards. Our manufacturer is proud to be a certificate holder (FSC-C002394) and uses FSC woods exclusively across their entire line of products. Once the right wood is chosen and used to build our furniture, applying a responsible and healthy stain is a must. We use WOCA natural oil stain on all of our tables, chairs and wood case goods. WOCA stains are plant-based, sustainable, and non-polluting and contain no artificial pigments or preservatives. Along with being a naturally durable substance, oil-based stain also protects against scratches and indentations better than a standard urethane finish. Pine Street Natural Interiors strives to offer high-quality, comfortable, beautiful furniture, while honoring and protecting our planet and our families. We take every step to ensure that all of our products benefit our customers and our environment in as many ways as possible. Every aspect of the construction, sourcing, design and shipping is researched and taken into consideration when we introduce a new product. By using natural latex, organic wool, goose feathers and down, and properly stained FSC woods, we offer the peace of mind that the furniture you own is not only the best looking and feeling, but the best for your health and your family's health.